On behalf of the staff at Red Barn Veterinary Hospital, we are honored to pay respect to our beloved animal friends who have passed. We also welcome you to create a lasting tribute for your beloved pet or animal friend on our website's Pet Memorial page. Please feel free to complete the following Pet Memorial Form in Adobe Acrobat format, which requires the free Acrobat Reader to view. 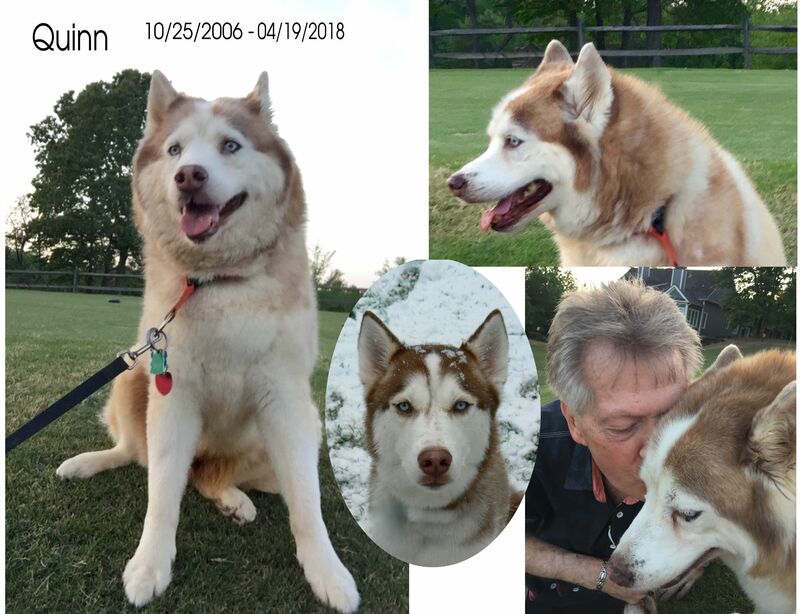 We lost a husky, Indigo, in 2005. She was only seven. Our daughter was at Petsmart on an adoption day in 2006 and saw a rescued 3 month old husky puppy. She told us about him and we went to "just look." We applied to adopt him that day...along with 2 other families. Due to the fact that we had previously owned a husky and our yard had an electric fence we were chosen. We named him Quinn and brought him home to our 12 year old Aussie. She became "mom" to him. Six years later we lost Meeko, the Aussie, and adopted another Aussie from a rescue group. Quinn now had an energetic younger "sister." We named her Faith. They loved their daily walks. During my husband's cancer treatment, surgery and recovery Quinn was always laying at his feet giving him support the best way he knew how. Quinn's favorite place to sleep in our house was the screened porch off of our bedroom. It didn't matter if it was 5 degrees outside, that's where he wanted to be all night! We found out last week that Quinn had an inoperable tumor. He had been moving slower lately but we thought it was due to his age and arthritis. He still was going on his daily walks up until the day before we came to Red Barn. It was such a difficult decision but we didn't want him to suffer. We are heart broken and so is Faith. Everyday when I walk her she stops to smell Quinn's favorite stopping places, Then she turns around to see is my husband and Quinn are behind us. it is sad but I do believe our precious animals go to heaven and we will see them again. They are such spectacular examples of unconditional love we humans should take a cue from them! !